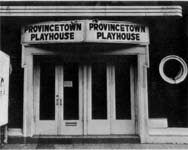 The Playhouse, once upon a time. few Art Deco touches around the entrance. Tearing down this historic and important off Broadway playhouse would be a scandal and a disgrace. It has housed innumerable important shows, beginning with O'Neill's one-act plays, demonstrating that a postage stage can still be hospitable to great art. I performed on this stage myself in the summer of 1949 when a group I helped to form, named Studio 7, spent two season there, doing Lorca, Strindberg, and others. Please use this letter in any way you wish to help save this historic stage. Curbed--that essential site on NYC real estate--has more on the controversy and on all the neighborhood/university politics involved.